No gimmicks here, just designs that will appeal to watch enthusiasts combining mechanical accuracy with cool visuals. In addition to exotic woods, such as Zebrawood, Koa, Black Palm, and Ebony, JORD incorporates other natural materials such as black Marquina and white marble. JORD has also quickly become a favorite amongst Apple Watch owners, who can buy specialized straps made from wood or leather. JORD men’s watches are available in a wide range of series. Covering all sizes and aesthetics, the selections are affordable and appealing, while each series is available in several wood finishes and designs. The Black Palm Limited Edition MERIDIAN is a particular standout in the men’s range. This spectacular watch is made from Borassus Flabellifer and is only available in a run of 300 made-to-order pieces. 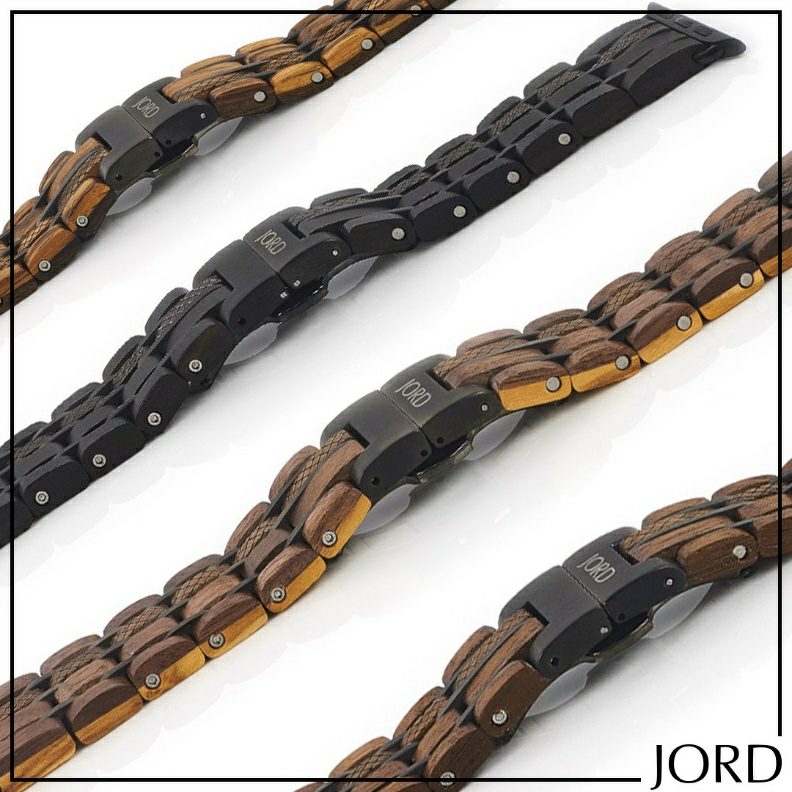 JORD has also debuted its RIST (Resin-Infusion Stabilization Technology) on the Black Palm. RIST is a specialized resin solution that has been developed to allow added strength and a more premium finish. JORD achieved this leap in technology by placing the Black Palm wood into an activated resin, which was then put under a vacuum. The company describes the innovation as horology first, providing the wearer with a more durable and resistant material. 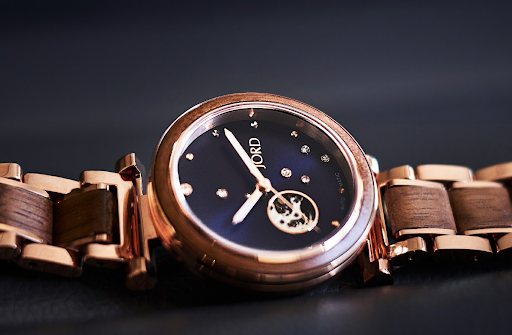 Some JORD watches are suitable for both men and women, such as JORD’s most popular seller, the Frankie, which comes in several color/wood combinations. Elsewhere, timepieces are versatile and elegant in the ladies range, available in several finishes, such as leather, mesh, and of course wood. The latest addition to the JORD lineup is the SIER ARCADIA series. Four new timepieces designed for women, the SIER ARCADIA marries elements such as black Marquina and white marble combined with rose gold. Customers can choose between mesh or leather interchangeable bands, as well as JORD’s famous wooden offerings. 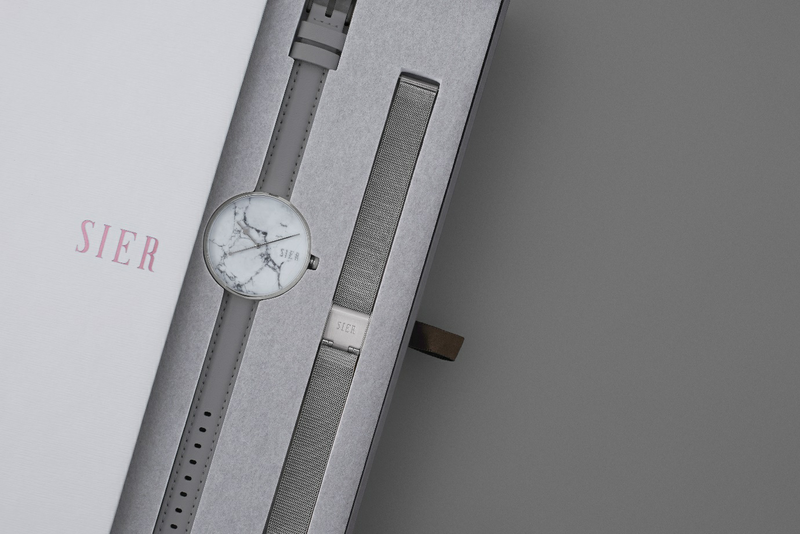 Early in 2019, JORD will release its new Cora watch for women. Available in several color combinations (Walnut & Navy, Zebrawood & Turquoise, and Koa & Rose Gold). The Core is a 34mm timepiece with a Swarovski constellation dial with an open window to the Citizen Miyota 6t28 automatic movement. 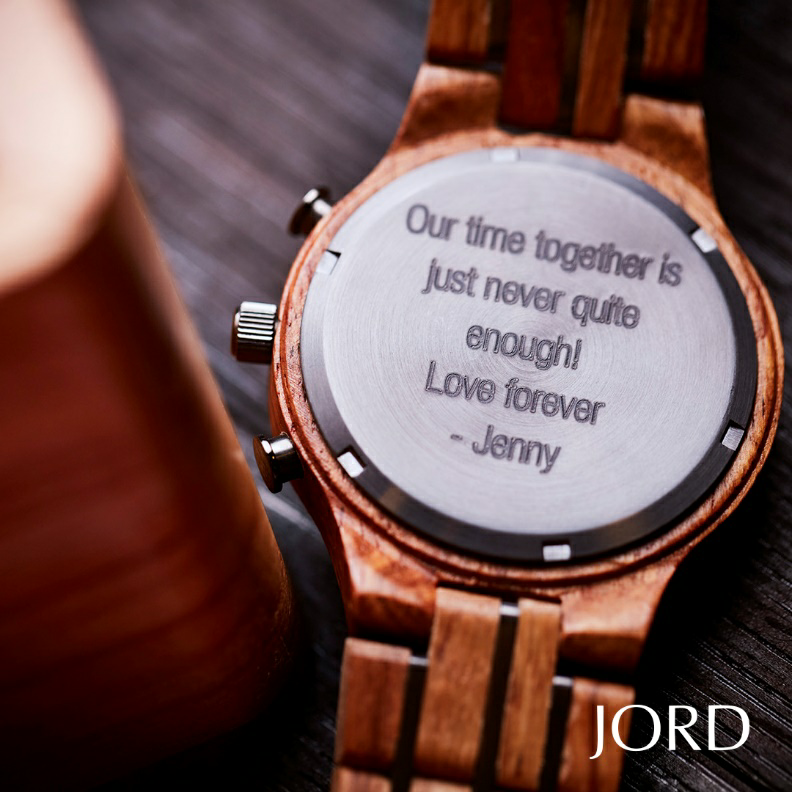 JORD understands that their timepieces are unique, making them interesting talking points or fantastic gifts. Customers can add that extra touch of interest by personalizing their JORD timepieces. Customization options include personal engraving, while each watch can be opulently presented in a cedar humidor box. Available now in a range of designs and prices, JORD watches are quickly becoming a hot topic amongst watch aficionados, who appreciate the attention to detail. 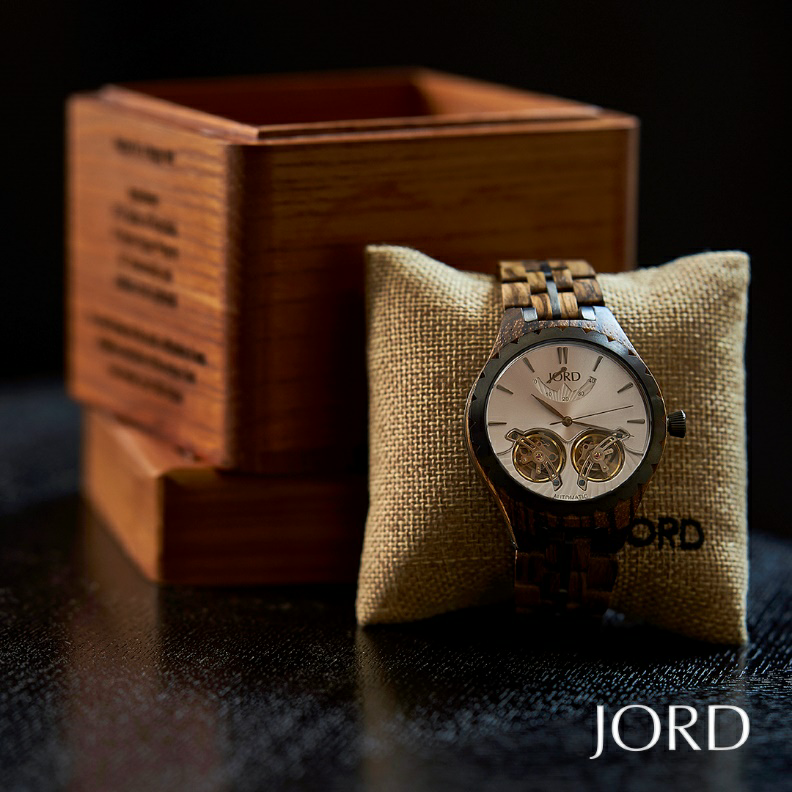 JORD has simply done the wooden watch right, and the results are a series of unforgettable timepieces.